Michael Desiderio and Cody. Photo by Ric Shaffer Photography. Gladstone, N.J. – Aug. 18, 2017 –The jumper divisions kicked off in the main arena at Hamilton Farm, and the 1.25m $5,000 Welcome Stake, sponsored by ColorTACK and Equine Billing Services, was scheduled as the featured event of the day. Riders found inspiration from the greats that once rode at the former training grounds of the U.S. Equestrian Team. Skip Bailey designed the technical track for the feature class. After the eight competitors had tackled the course, management opted to hold the class as a storm passed, then called it. Only eight of the 26 completed the course and Cassandra Kahle and Fiene, owned by Redfield Farm, emerged as the winners, with the fastest, clear jump--off round of 28.442 seconds. Riders, friends and family took shelter in the hospitality tent and enjoyed Greek food, Tito’s cocktails and cheer. Earlier in the day, Michael Desiderio won the $500 1.20m Jumpers aboard Cody, owned by Marlee Malamut. The Desiderio family and their Tranquillity Farm, located in Chester, New Jersey, is well-known in the area and on the show circuit. Led by parents Stephanie and Ricci, they run a top-notch hunter/jumper show operation and also compete Arabians at eight to 10 shows each year. They currently have about 75 horses in training. Desiderio’s brother Vinnie and sister Alexandria, who rides for Texas A&M, share his love for the show ring while another brother has opted for law school. Tranquillity Farm client Malamut competes Cody in the low amateurs and has had him for about three years. Desiderio used the 1.20m class to school him for the weekend and ended up with the top prize. Desiderio is an accomplished rider and has taken his share of victory gallops. He was recently fourth in an $86,000 FEI 2*Grand Prix during Tryon Summer with Aminka, a Dutch Warmblood mare owned by Tranquillity Farm. Caroline Sameth was on hand to represent the Sameth Family to present the award. Photo by Ric Shaffer Photography. In the morning, the USHJA Outreach Program divisions, sponsored by the Sameth Family of Far Hlls, New Jersey, took place. 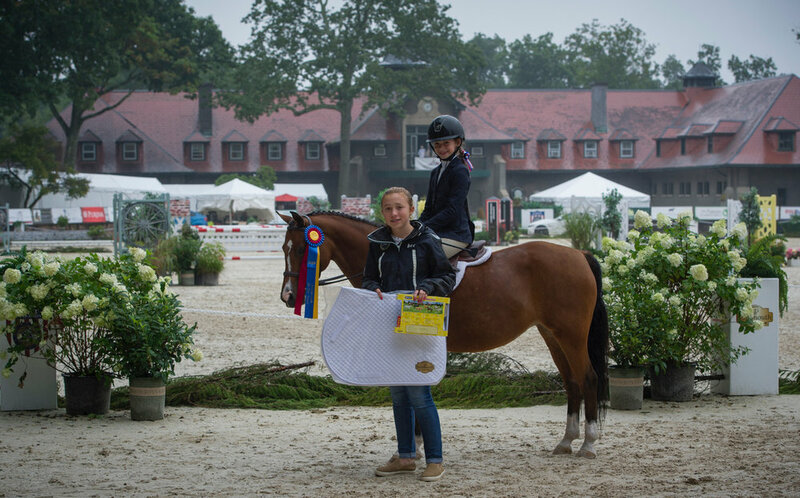 The USHJA Outreach Program provides members with an opportunity to earn national recognition in classes from walk/trot/canter through the 3’ hunters, jumper and medal competition. The program is designed to celebrate riders as they advance through the competition and offers year-end awards and certificates of merit. Monmouth at the Team thanks the Sameth Family for their generous sponsorship of the division. ColorTACK produces high-quality spurs and stirrups made to order in a range of colors, from bling to subtle. ColorTACK also offers color customization of your own spurs and stirrups. Stop by their booth during Monmouth at the Team to see the range of possibilities or go to ColorTACK.com to learn more. Equine Billing Services provides an effective, accurate and secure solution to billing, tailored to the needs of equestrian businesses. Go to EquineBillingServices.com for more information. Exciting jumper action continues Saturday at Monmouth at the Team as juniors and amateurs take to the main arena at Hamilton Farm. The featured classes include the $2,500 Low Children's/Adult Jumper Classic, sponsored by ZEUS Scientific and the $5,000 Marshall & Sterling/NAL/WIHS Children's/Adult Classic, sponsored by Manhattan Saddlery. ZEUS Scientific produces high-performing, highly accurate testing solutions for flexibility and efficiency in the lab. Saturday is Manhattan Saddlery at Monmouth at the Team. Manhattan Saddlery is the only equestrian tack shop in New York City. They have been outfitting riders, horses and lovers of equestrian style since 1912. At 2 p.m. on Saturday at the Manhattan Saddlery booth, Penguin Ice Cream of Bernardsville will serve lemon ice and ice cream. Make your day a little cooler and a little sweeter thanks to Manhattan Saddlery.